We’re living in a world that is as connected to past media as it is to present media. While some reminders of the past are good, others have to come with their own “ethnic and racial prejudice” warnings. Recently, we learned Amazon Prime has slapped one of these warnings on a very famous cartoon. Tom and Jerry, the cat and mouse comedy created way back in 1940 by William Hanna and Joseph Barbera, now comes with its own warning label. As first noted by BBC News, Amazon has plenty of Tom and Jerry cartoons available for streaming as part of its service, but if you click on Tom and Jerry: The Complete Second Volume, you might note the following warning label. "Tom and Jerry shorts may depict some ethnic and racial prejudices that were once commonplace in American society. Such depictions were wrong then and are wrong today." The phrasing is extremely similar to some of the words used to describe Tom and Jerry in recent DVD releases put out by Warner Bros. who purchased the property from its original distributor, MGM. This isn’t the first time that the show has come under fire for racial prejudices. Notably, Tom and Jerry character Mammy Two Shoes has earned criticism for being a stereotypical archetype of an African American woman. She’s even sometimes reimagined as a white lady. Other blackface gags and moments where natives are portrayed un-ideally have also been cut out or changed in subsequent releases of the old cartoon. Other scenes from the series, including moments featuring characters who are smoking, have also come under fire. 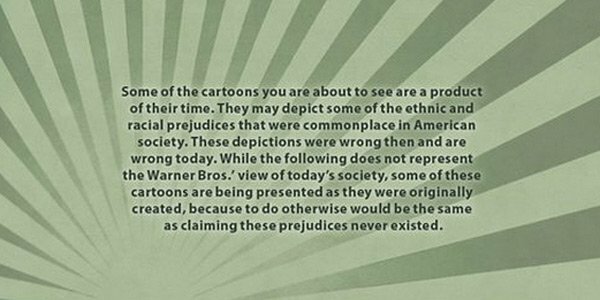 With the Amazon Prime release, it looks like Warner Bros. wants to preserve the authenticity of the old cartoons, but feels more comfortable pointing out the past racial attitudes that are no longer acceptable in today’s society. It’s a two-sided argument. On the one hand, it’s easy to see why the veteran entertainment company would not want to seem like it was perpetuating old standards of race relations in today’s world. On the other hand, Tom and Jerry is a classic cartoon with plenty of collectors. Changing or cutting out episodes due to moments in the cartoons that no longer conform to a modern worldview also means that a lot of brilliant early animation and slapstick comedy ideas are lost. You can’t preserve one without also preserving the other, and a warning is probably the most faithful thing Warner Bros. feels it can do for the series, even if a warning is also basically an insult stating the company thinks people won't understand the difference between past values and present values when they watch. Revisionist history never did anyone much good, but I'm not sure warning labels are particularly helpful, either.